Regular breeding resident and migrant statewide; regularly observed throughout the state during the winter months depending on weather conditions and food availability. The American Robin was a very abundant species during the Minnesota Breeding Bird Atlas (MNBBA) and was the most frequently reported species. The American Robin’s breeding distribution extends across most of North America, from northern Alaska south across Canada and the United States and south to the central interior of Mexico. During the summer, the species is absent from the very southern regions of California, Texas, and Florida. Abundant throughout much of their breeding range, robins reach some of their highest densities in the north-central states (Figure 1). A short- to medium-distance migrant; most of Minnesota’s breeding robins winter in the southern United States and Mexico. Omnivorous, foraging on the ground and in trees and shrubs. Open-cup nest placed in a tree or shrub 1.5 to 8 meters above the ground. A variety of building structures may also be used, including windowsills, mailboxes, and fence posts. Breeding distribution and relative abundance of the American Robin in North America based on the federal Breeding Bird Survey, 2011-2015 (Sauer et al. 2017). In Minnesota, the American Robin has been considered an abundant breeding resident throughout the state since the late 1800s (Roberts 1932). Describing it as one of the “most beloved” of all Minnesota birds, Roberts commented that the robin “has thoroughly adjusted itself to civilized conditions and has come to prefer our lawns, gardens, and orchards to the wilder places. It is, however, not unknown in the depths of the northern forests where it seems strangely out of place.” The species’ abundance in the western grasslands was less clear. All but one of the 17 counties where confirmed or inferred nesting reports were available were confined to the forested regions of the state and the northwest aspen parklands. Abundant during the summer’s breeding season, even during the early 1900s, some robins were known to overwinter, especially in southern Minnesota. In 1975, Green and Janssen reported that the species was a summer resident “throughout the state, from the prairie to the dense northern forests.” Janssen (1987) included a distribution map in his updated account that identified 52 counties where nesting had been confirmed since 1970. By 1998, nesting had been documented in 20 additional counties (Hertzel and Janssen 1998). The Minnesota Biological Survey further confirmed the robin’s statewide abundance (Minnesota Department of Natural Resources 2016). MNBBA participants reported a total of 10,227 American Robin records in 85.3% (4,213/4,940) of the surveyed atlas blocks and in 97.4% (2,276/2,337) of the priority blocks. Breeding evidence was confirmed in 30.5% (1,509/4,940) of the surveyed blocks (Figures 2 and 3; Table 1). The birds were observed in all 87 counties, and breeding was confirmed in all 87 counties. The birds were equally distributed across all of Minnesota’s ecological provinces. The MNBBA predicted distribution map (Figure 4) depicts moderate densities of breeding birds can be found, with few exceptions, statewide. Higher breeding densities are invariably associated with metropolitan areas and small communities, especially in southeastern Minnesota. Little appears to have changed regarding the American Robin’s distribution and abundance in Minnesota during the past 100 years. The same is true in states throughout the Upper Midwest (e.g., Cutright et al. 2006; Chartier et al. 2013; Rodewald et al. 2016). Overall, the species’ distribution and abundance have increased with the planting of trees associated with farmsteads in the grasslands and residential developments throughout North America. The establishment of earthworm populations in many western states also enabled the robin to expand its range both southward and westward over the years (Vanderhoff et al. 2016). Breeding distribution of the American Robin in Minnesota based on the Breeding Bird Atlas (2009 – 2013). Summary statistics of observations by breeding status category for the American Robin in Minnesota based on all blocks (each 5 km x 5 km) surveyed during the Breeding Bird Atlas (2009-2013). Summary statistics for the American Robin observations by breeding status category for all blocks and priority blocks (each 5 km x 5 km) surveyed during the Minnesota Breeding Bird Atlas (2009-2013). Predicted breeding distribution (pairs per 40 hectares) of the American Robin in Minnesota based on habitat, landscape context, and climate data gathered during the Minnesota Breeding Bird Atlas (2009-2013) using the General Linear Modeling method with an adjustment for detectability. Originally a forest species, the American Robin is a habitat generalist that shows a preference for early successional forest stands created by timber harvest, windstorms, or fire. Today, developed landscapes, including residential lawns, city parks, golf courses, and cemeteries, all provide ideal habitat (Figure 5). Open ground for foraging, and trees and shrubs for nesting are prime features of suitable habitats; the vegetative composition and age of a site are less critical (Danz et al. 2007). The National Forest Bird Monitoring Program in northern Wisconsin and Minnesota documented the species’ utilization of virtually every habitat that was available, from mature upland stands of aspen-birch and lowland black spruce–tamarack to regenerating stands, open wetlands, and small towns (Niemi et al. 2016). Although robins’ use of diverse habitats was ubiquitous, they were most strongly associated with small residential areas. A similar preference was demonstrated by habitat data collected within 200 meters of MNBBA point counts. Detected at some level in all habitats, they showed a clear preference for developed landscapes (Figure 6). It is the very open nature of the robin’s habitat that has enabled the species to adapt to a wide range of modified landscapes. Not only do they thrive in these altered habitats when suitable trees and shrubs are available, they reach some of the densest populations there as well (Vanderhoff et al. 2016). Typical breeding habitat of the American Robin in Minnesota (© Lee A. Pfannmuller). Habitat profile for the American Robin based on habitats within 200 m of point counts where the species was present during the Minnesota Breeding Bird Atlas (2009-2013). Using data gathered by the federal Breeding Bird Survey (BBS), biologists have estimated the North American population of American Robins to total 380 million breeding adults (Rosenberg et al. 2016). In 2013, Minnesota was estimated to support approximately 1.8% of the continent’s population (Partners in Flight Science Committee 2013). Applying that percentage to the most recent population estimate generates a statewide population of 7 million birds. The population estimate derived from MNBBA data is considerably lower, at approximately 3.5 million adults (95% confidence interval of 3.4 to 3.7 million adults). American Robins are twice as abundant in Minnesota as they are across North America. The average number of robins detected on BBS routes in the state each year is 68 birds; the average across the North American BBS survey area is 33 birds. Illinois supports the highest breeding density in the United States with an average of 92 birds on BBS routes (Sauer et al. 2017). In northern Minnesota, the National Forest Bird Monitoring Program detected an average of 1.5 pairs per 40 ha on the Chippewa National Forest, and 1.8 pairs per 40 ha on the Superior. The species reached its highest breeding density (3.4 pairs per 40 ha) in regenerating conifer stands on the Chippewa and in pole-size red pine stands on the Superior (4.7 pairs per 40 ha). On both forests the American Robin was the third most abundant thrush, preceded by the Veery and Hermit Thrush (Niemi et al. 2016). Since the BBS began in 1966, the long-term population trend for American Robins throughout North America has been a slow and steady increase at an average annual rate of 0.12% per year. In Minnesota, BBS data reveal a significant annual increase of 0.74% per year (Figure 7). Although the overall trend is positive, there are pockets throughout the BBS survey area where robin populations are declining (Figure 8). Most increasing populations are located in the central United States and Canada; most declining populations are in western North America, in the Great Lakes region, and along the East Coast. This plurality of trends is also seen on the Chippewa and Superior National Forests. Robins have significantly declined on the Chippewa National Forest from 1995 to 2016, while they have significantly increased on the Superior (Figure 9). Factors responsible for these regional differences at both the national and state level are unknown. Predation, disturbance, and inclement weather are considered the primary culprits impacting local breeding populations (Vanderhoff et al. 2016). 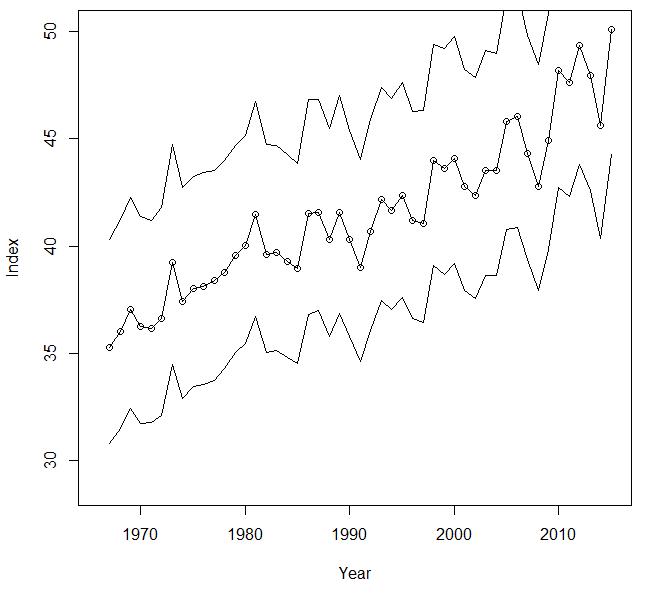 Breeding population trend for the American Robin in Minnesota for 1967–2015 based on the federal Breeding Bird Survey (Sauer et al. 2017). Population trend map for the American Robin in North America for 1966–2015 based on the federal Breeding Bird Survey (Sauer et al. 2017). 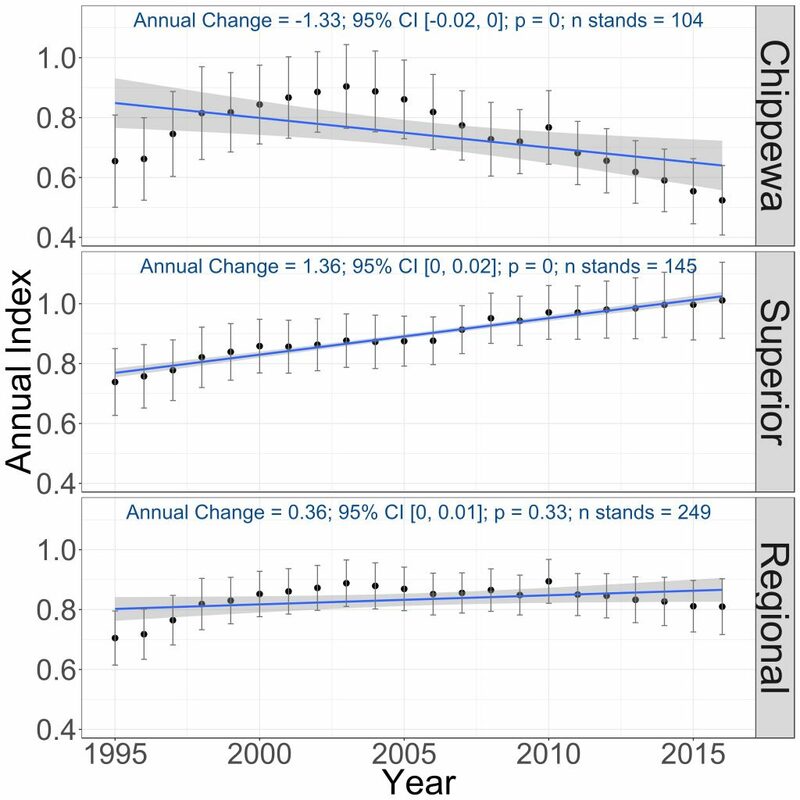 Breeding population trends of the American Robin in the Chippewa and Superior National Forests and the combined regional trend, 1995–2016 (Bednar et al. 2016). One of the most widespread and abundant birds in North America, the adaptable American Robin is not a conservation priority at either the federal or state level. It has been assigned a relatively low Continental Concern Score of 5/20 by Partners in Flight (Rosenberg et al. 2016). Climate change also appears to present few risks to the species (North American Bird Conservation Initiative 2010). The only significant long-term concern is the robin’s susceptibility to pesticide contaminants. Notable declines in the 1950s and 1960s as a result of DDT poisoning thrust it into the limelight following the publication of Rachel Carson’s Silent Spring (Cutright et al. 2006). Although populations have recovered, the robin remains heavily dependent on earthworms found in residential lawns and urban and suburban parklands, as well as on fruits that may be taken from well-managed orchards (Vanderhoff et al. 2016). As a result, the robin continues to be exposed to a variety of pesticides and herbicides, and its long-term future should not be taken for granted.